Model: XTR2500.1Dz. Efficient Class-D amplifier circuitry. Car Audio 1-channel Monoblock Class D Amplifier. Max power output: 10000 watts x 1 channel. 4 ohms:1050 watts x 1 channel. 2 ohms:1600 watts x 1 channel. Orion XTR series XTR650.1D. This XTR650.1D has 2600 Watts Max Music Power. Amplifier Wiring Kits. Total Max Power: 2600 Watts. Power: 4 Ohms Mono at 12.6V: 275 Watts RMS x 1 Channel. Power: 2 Ohms Mono at 12.6V: 450 Watts RMS x 1 Channel. Classic Orion Industrial Design. 1 x 1500 @ 1 ohm. Class D mono block. Put the completed RMA FORM inside the box with your item. 6000 Watts Max. - 12dB/Octave Low-Pass Filter. Alaska, Puerto Rico, Hawaii, Residents. 240 WATTS X 1 RMS @ 4 OHM MONO 14.4V. 500 WATTS X 1 RMS @ 1 OHM MONO 14.4V. 325 WATTS X 1 RMS @ 2 OHM MONO 14.4V. 2000 Watts Max. 1000 Watts Nominal. Put the completed RMA FORM inside the box with your item. ORION COBALT CB2500.1D 2500 WATTS MAX POWER. This is Orion's CB2500.1D Class D Monoblock 1 Channel Amplifier. This amplifier is designed and crafted with the best components on the market. Built in a heavy duty rugged die-cast aluminum heatsink with great internal components. 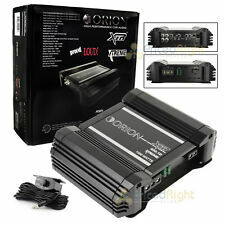 ORION COBALT CB1500.1D 1500 WATTS MAX POWER. This is Orion's CB1500.1D Class D Monoblock 1 Channel Amplifier. This amplifier is designed and crafted with the best components on the market. Built in a heavy duty rugged die-cast aluminum heatsink with great internal components. Model: CB2500.1D. Car Audio 1-channel Monoblock Class D Amplifier. Max power output: 2500 watts. Input sensitivity: 150mv-5v. Put the completed RMA FORM inside the box with your item. Subwoofer enclosures are not covered by Techronics' warranty. Orion XTR1000.1D. 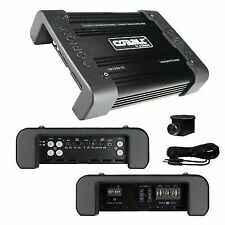 Mono Car Amplifier 1000W RMS Series Class D Mono Channel Amp. Power: 4 Ohms Mono at 12.6V: 400 Watts RMS x 1 Channel. Power: 2 Ohms Mono at 12.6V: 700 Watts RMS x 1 Channel. Power: 1 Ohms Mono at 12.6V: 1000 Watts RMS x 1 Channel. RMS Watts @ 4 Ohms Mono at 12.6V:1050 Watts x 1. · RMS Watts @ 2 Ohms Mono at 12.6V:1600 Watts x 1. · RMS Watts @ 1 Ohm Mono at 12.6V:2500 Watts x 1. · Total Nominal Power:5000 Watts. Car Audio 1-channel Mono block Class D Amplifier. 1 ohm: 500 watts x 1 channel. 4 ohms: 240 watts x 1 channel. 2 ohms: 325 watts x 1 channel. Max Music Power: 2000 watts. Watts Nominal: 1000 watts. Car Audio 1-channel Mono block Class D Amplifier. 4 ohms: 600 watts x 1 channel. 2 ohms: 1040 watts x 1 channel. 1 ohm: 2000 watts x 1 channel. Max Music Power: 8000 watts. Signal to noise Ratio: 93 dB. Orion ZO12000.1. CLASS D MONOBLOCK AMPLIFIER. 1-Ohm Stable Monoblock Class D Amplifier. 3-way protection circuitry (thermal, overload, and speaker short protection). Mono channel operation. Bass Frequency: 30 - 80 Hz. 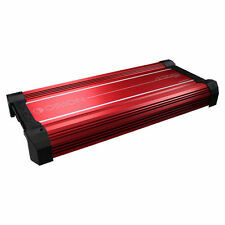 ORION XTR CLASS D MONOCHANNEL AMPLIFIERS 2500 WATTS RMS. RMS Power @ 4 Ohms Mono @ 0.5% THD N. RMS Power @ 2 Ohms Mono @ 0.5% THD N. RMS Power @ 1 Ohms Mono @ 0.5% THD N. THD at 1 Watts 4 Ohms. Power Car Audio. Orion XTR1500.1Dz XTR Series Class D Mono 1500W Amplifier. RMS Watts @ 1 Ohm Stereo 12.6V: 1500 Watts X 1 Channel. RMS Watts @ 4 Ohm Stereo 12.6V: 600 Watts X 1 Channel. RMS Watts @ 2 Ohm Stereo 12.6V: 975 Watts X 1 Channel. 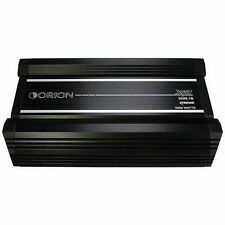 ORION XTR AMPLIFIER CLASS D MONO CHANNEL 1000 WATTS RMS. RMS Watts @ 4 OHM Mono 12.6V. RMS Watts @ 2 OHM Mono 12.6V. RMS Watts @ 1 OHM Mono 12.6V. Total Max Music. Power Car Audio. 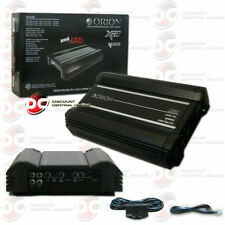 Orion CB5000.1D 10000 Watt Class D Monoblock Car Audio Stereo Amplifier. Max Music Power Watts: 10000. Input Impedance: 22K ohm. Input Sensitivity: 150mV-5V. Put the completed RMA FORM inside the box with your item. Used for about 2 months before I sold the car. This amp is still in perfect working condition, had it on 1 12"alone type R & it sounded phenomenal! Model: CB1500.1D. Car Audio 1-channel Monoblock Class D Amplifier. 1 ohm: 750 watts x 1 channel. Mono channel operation. 4 ohms: 275 watts x 1 channel. 2 ohms: 360 watts x 1 channel. Max power output: 1500 watts. ORION employed the best quality components held to strict tolerances to assure a long life, and ORION amplifier's are designed to produce powerful hard hitting and clear music. RMS Watts @ 1 Ohm Mono: 1250. 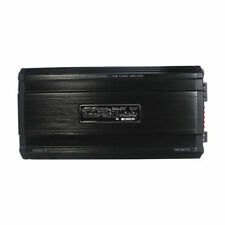 Cobalt Series Monoblock Class A/B Car Amplifier. 3-Way system protection circuitry (thermal, short circuit, and overload). CEA-2006 compliant amplifier. Mono channel operation. Put the completed RMA FORM inside the box with your item. 600W HCCA High Current Competition Class D Monoblock Amplifier. 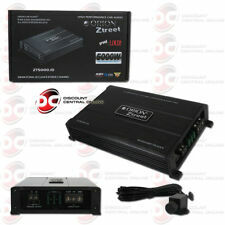 Orion HCCA-D600 600 watt Monoblock Car Audio Stereo Amplifier. bass remote not included. Burnt voice coils. Put the completed RMA FORM inside the box with your item. ORION 2500D -- REPAIRED BY VIAEXCEL AMP REPAIR.. Repaired by VIAEXCEL AMP REPAIR. TESTED -- Working Amp No Problems and No distortion. See Pictures to observe Amp. Case In good condition. 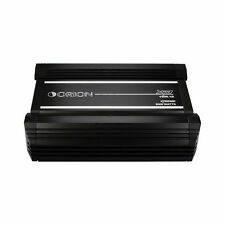 ORION COBALT CLASS D MONOCHANNEL AMPLIFIER 1500 WATTS. Bass Boost. 15Hz - 400Hz. Low Pass Freq.